My First Library: Mickey Mouse Clubhouse Only $8.98 + FREE Prime Shipping (Reg. $15)! You are here: Home / Great Deals / Amazon Deals / My First Library: Mickey Mouse Clubhouse Only $8.98 + FREE Prime Shipping (Reg. $15)! My 2 year old adores Mickey Mouse so I had to grab this deal when I saw it! 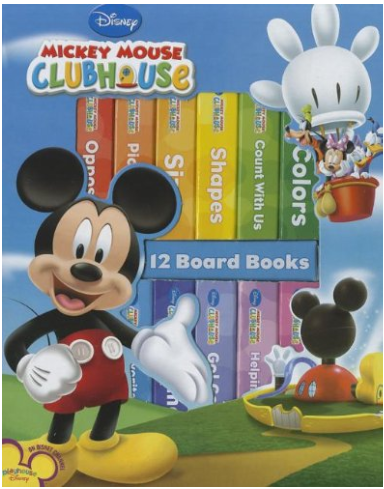 Right now, snag this My First Library: Mickey Mouse Clubhouse Book Set for Only $8.98 (Reg. $15)! The books have board pages that withstand rips and tears, and the pages are coated for easy clean-up in case of spills. Together, these books form a fun library of colorful, exciting stories for the youngest Mickey Mouse fans.